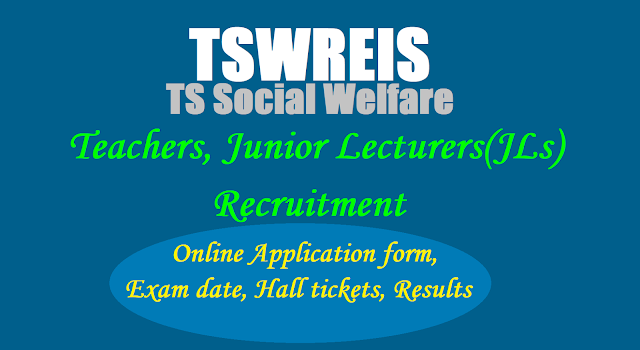 Tswreis Teachers, Lecturers(JLs) Recruitment 2017 Hall tickets, final selection list: Tswreis Teachers,Junior Lecturers(JLs) Recruitment/ Online Application for Part time Teachers/ Junior Lecturers Recruitment in TSWR Institutions/Tswreis Junior Lecturers, Teachers Recruitment 2017,TS Social Welfare JL, Teacher posts online application form 2017, Last date for apply, How to apply, Selection process details are given here. 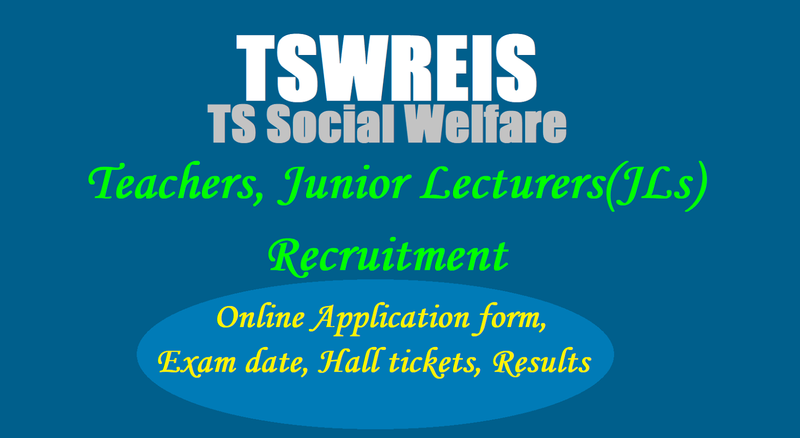 Telangana Social Welfare Residential Educational Institutions Society has published the Junior Lecturer/Teacher posts recruitment notification on 06-06-2017 and online applications are invited from experienced, dedicated and capable staff to teach for Intermediate students in inin TSWR Institutions and to work as Part-time Teacher in TSW Residential Schools for the academic year 2017-18 and interested to work on “Outsourcing basis/Part time” in TSWR Institutions. Remuneration will be commensurate with performance and experience. to work as Part-time Teacher in TSW Residential Schools for the academic year 2017-18.
to work as Part-time Junior Lecturer in TSWR Institutions for the academic year 2017-18. The remuneration payable to the Part-time Teachers is Rs.14,000/- per month @ 140/- per period and Part-time JL is Rs.18,000/- per month @ Rs.180/- per period not exceeding 100 periods in a month depending on the work load in the subject concerned. PET – Rs.10,900/- per month and Staff Nurse – Rs.10,900/- per month. 1. Candidates belonging to Zone-V and Zone-VI are alone eligible to apply. 2. The services of the selected candidates will be utilized purely on temporary basis during this academic year 2017-18. A candidate must be a Graduate (i.e., B.A / B.Sc./B.Com) recognized by the UGC with relevant subject and B.Ed./TPT/HPT in concerned subject as one of the methodology. B.Ed./TPT in concerned subject as one of the methodology. The candidates are informed to draw a D.D. / Banker’s Cheque for Rs.200/- (as examination fee) in favour of the Secretary TSWREI Society, Hyderabad and submit the same at Examination Centre. Without D.D / Banker’s Cheque candidate will not be allowed to appear for the exam. Hall tickets will be kept available in website before 3 days from the date of written test. The candidates shall download from website. The last date for submission of application is 17.06.2017 up to 5:00 p.m.